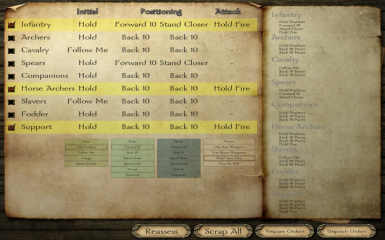 Module System code kit adding a pre-battle presentation where the player can assign a set of battle starting orders to the various divisions/group in the player's party. 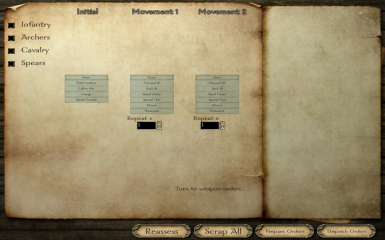 In this version, the player can select the following for each group: an Initial Order (charge, hold, follow), two movement orders (chosen from Forward/Back 10 paces, Stand Closer, Spread Out, Mount and Dismount) and a weapon use order (chosen from the Native weapon use orders Fire At Will, Hold Fire, Any Weapon, Blunt Weapons). Movement orders can be repeated up to 4 times. This version of Pre-Battle Orders is "Expanded" and adds a set of orders to that which are available Natively. 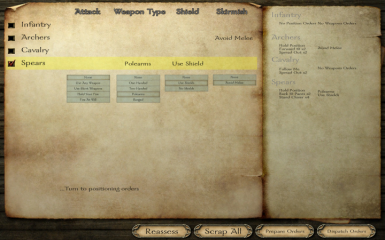 Now, your troops can be instructed on exactly which weapon type to wield, whether or not to use shields, and for ranged troops whether they should engage in melee combat or not. These are accessed similarly to Native orders in that you press a 'F' function key that opens a display outlining the various orders available and they are given to whichever divisions are currently selected. For more details, see the Readme. 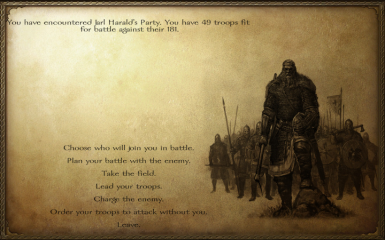 It also adds options to the encounter menu to choose for all troops to begin the battle holding or following, rather than charging.